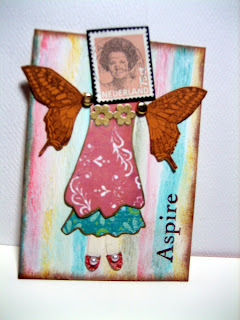 My friend Kim posted a lovely dolly a couple of days ago and inspired me to attempt an ATC dolly. So, may I present Queen Beatrix. .....She is modeled very much after our friend Queen E, but unlike Kimmie's sweet and playful dolly, our friend Beatrix is sedate and regal in her bearing, and has what appears to be giant ankles. In her defense, I should have shaded her legs so you can see that she has very slim and fetching ankles. I watercoloured the background and fingerpainted over with gesso in a poor attempt at emulating Kim's gorgeous background. 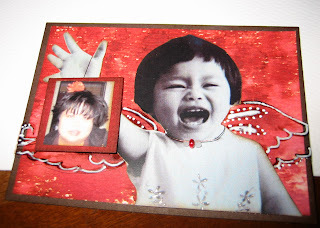 The ATC was also sponged with Distress Ink Vintage Photo. Her dress is outlined with gold Zig painty and her lovely sparkly shoes are made of burnt red glimmer mist scraps (Tattered Angels) and highlighted with half pearls. Her wings are from SU Natural Beauty set. 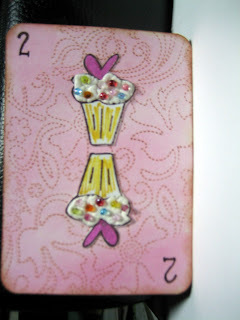 2 of Cupcakes and 2 hearts in Paris was for Susie's Altered Playing Cards theme last week. I am on a pink and brown kick, obviously. 2 of Cupcakes has a SU stitched bkg stamped in SU close to cocoa onto a SU Rose Red watercoloured bkg. The Cupcakes are a Mike's stamp and has Liquid Applique frosting and yummy looking seed beads. 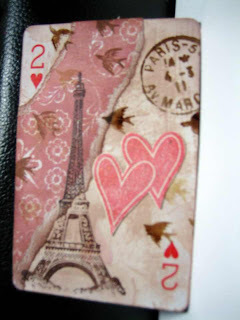 2 of hearts is gessoed and stamped with Distress Tea dye. 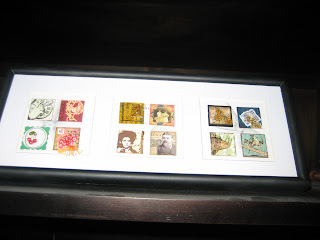 The stamps are from Cavalini & Sons (Eiffel Tower, postoid), SU (hearts-Love matters) and Teesha Moore (birds). The ATC below was created for Kim's Who's Who Swap on SCS. This was completed a month ago but since we're on th topic of ATCs.... Bkg is salt resist technique. I took the liberty of adding acetate wings to the little kid (me- and if you knew me growing up, you'd be ROTFL). The acetate wings were enhanced with a white Souffle pen.Yes, there is a little bead necklace on the kid. And the flowers on the dress were highlighted with Stardust clear as well. Posted by Diane aka cameldiva at 12:02 a.m.
You do awesome work .... and you aughtn't be so self-deprecating about Queen Beatrix - she is my own dollies newest friend you know! June 7, 2008 at 10:04 a.m. I love the one with the picture of you in it! June 11, 2008 at 10:05 p.m.
That dolly rocks, and I lurve the way you framed your inchies! June 14, 2008 at 4:05 p.m.
You are so talented! 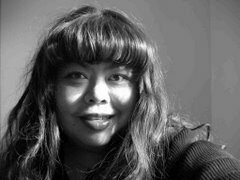 Your writing is awesome, your story of the 'dandy-lions' is so great! Thanks for sharing that. June 24, 2008 at 8:28 p.m. Hi!!! I can't believe I haven't found your blog until tonight! I got your comment - thanks :-) I am going to put you into my favs and do some browsing tomorrow...it's getting late tonight. July 17, 2008 at 11:00 p.m.